The University of New Brunswick is establishing a research chair focused on Atlantic salmon as part of $1.3 million in funding from the Collaboration for Atlantic Salmon Tomorrow (CAST) to conduct innovative research projects aimed at curbing the alarming decline of salmon stocks. The investment by CAST – a partnership of scientists, environmental groups and industry participants focused on saving wild Atlantic salmon – earmarks $500,000 for the creation of the research chair while the remainder is focused on four research projects. 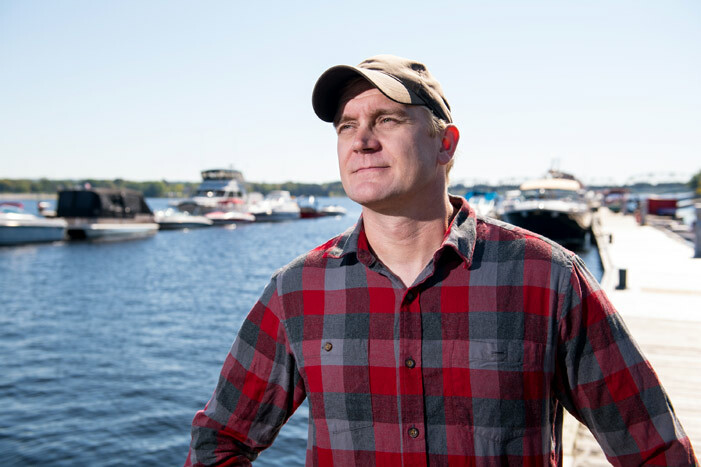 The research projects, undertaken by scientists at UNB and the Canadian Rivers Institute (CRI), will allow for a greater understanding of how Atlantic salmon behave, what is threatening the stocks and what might be done to revive them. The work will focus on one of the great Atlantic salmon rivers of the world, New Brunswick’s Miramichi River, though the techniques developed and knowledge generated will be applicable across the species’ range. At a news conference today at the university’s Fredericton campus, Canadian Rivers Institute Research Associate Tommi Linnansaari was introduced as the holder of the UNB CAST Atlantic Salmon Research Chair. Dr. Linnansaari, who in addition to his work with CRI has held various research positions at UNB since 2009, also becomes an associate professor of biology and forestry & environmental management at UNB with today’s appointment. Wild Atlantic salmon populations have experienced a precipitous decline since the 1980s in North America, with populations in some rivers now facing extinction. Immediate action is needed to generate the knowledge and tools that will help populations to recover and sustain themselves. The researchers of CAST will have an important role to play in this. “Today’s announcement is another positive step towards preserving and growing wild Atlantic salmon populations for generations to come,” said Hon. Bill Fraser, minister of transportation and infrastructure and minister responsible for the Regional Development Corporation. Dr. Frederick Whoriskey, chair of the Canadian Rivers Institute management board, said the announcement builds on the dedicated work of Canadian Rivers Institute researchers at UNB. The Thermal Imaging project will develop methods to understand how high water temperatures are affecting Atlantic salmon production and how to respond to these stressors. Thermal infrared imagery will be collected from 600 kilometres of the Miramichi River, then complemented with existing data at UNB to create highly detailed habitat maps to identify cold water refuge areas for salmon. The Smolt to Adult Supplementation initiative is a conservation method where wild smolt, on their way to sea, are collected and grown to adults at the Miramichi Salmon Association’s South Esk hatchery with the intention that the mature fish are then released to their natal river to spawn. Population modelling and a common home for all salmon data: Existing historic information on Atlantic salmon is not readily available to fishery scientists, managers or the public. To better support the research and work being done to protect Atlantic salmon, a data management system will be developed for all existing and future Atlantic salmon data in support of developing a comprehensive salmon management plan. The Adaptive Resolution Imaging Sonar (ARIS) project is developing an automated method for estimating the returning run of Atlantic salmon in certain sections of the Miramichi River. The method will provide an accurate and near real-time count of Atlantic salmon, as well as other large fish, even at night and in murky water conditions. The objective is to enhance assessments of salmon populations for fisheries managers. Fish counts collected through the project are available at CastSalmon.com. CAST (Collaboration for Atlantic Salmon Tomorrow) is a partnership of scientists, environmental groups, industry and government. The focus is on saving Atlantic salmon before it is too late. It is hoped that CAST will serve as a positive partnership model for Eastern Canada’s wild Atlantic salmon rivers. CAST partners include the Government of Canada, the Province of New Brunswick, the University of New Brunswick, the Canadian Rivers Institute, the Miramichi Salmon Association, Cooke Aquaculture and J.D. Irving, Limited. For more information about CAST research and partners: CastForSalmon.com. The Canadian Rivers Institute (CRI) was founded in 2001 as a collaboration of researchers at the University of New Brunswick at both the Fredericton and Saint John campuses to develop the aquatic science needed to understand, protect, and sustain water resources for the region, nation, and the planet. Today, CRI has grown into a collaborative of hundreds of research associates, graduate students, and staff based at institutions across Canada and internationally, working towards the vision of “making every river a healthy river." The University of New Brunswick (UNB) is Canada’s oldest English-language university. Founded in 1785, the multi-campus institution has a rich history and a dynamic focus on innovation, experiential learning and entrepreneurship. UNB has nearly 10,500 students from nearly 100 countries while several thousand more take UNB courses online and at partner institutions around the world. UNB contributes significantly to the province with an annual economic impact of $1.2 billion on the provincial economy – equivalent to 4.5 per cent of the gross domestic product of New Brunswick.